Article on the health advantages of Nordic walking as part of a mesomorphe exercise programme. Huge cardiovascular, strength and endurance benefits. Nordic walking in the Alps. 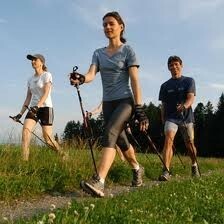 Nordic walking is fast becoming the exercise craze of the moment. Originally developed in Finland in the 1930's to help cross country skiers maintain fitness during the summer months, Nordic walking is a form of walking with poles whereby the athlete produces a glide by pushing simultaneously with both arms. It is an excellent way to maitain fitness and develop strength in the arms and chest. Walks can be as gentle or as vigorous as you wish; they can be a mile on the flat or several dozen miles on variable terrain, and can be a superb inclusion in a fitness rehabilitation plan. Nordic walking offers the opportunity to strengthen back and abdominal muscles, and it reduces the impact on the joints; an important consideration for anyone suffering from arthritis. It also improves posture and has been shown to increase the rate of calorie burn by up to 46%. Because of the higher levels of calorific expenditure and added focus on upper body strength Nordic walking can help in the development and maintenance of a mesomorphic body shape. Since Nordic walking is a fairly simple form of exercise there are very few requirements in terms of equipment. At the most basic level all that is needed are a robust pair of walking shoes and a set of Nordic walking poles. Specialised poles were developed in the late 1990's by ski pole manufacturer Exel in partnership with the Finnish Sports Institute, as concerns had been raised about the lack of impact absorption in the poles used up till then. Trials of the new design were so impressive that the sport was incorporated into fitness and rehabilitation programmes across Europe and by the middle of the noughties Nordic Walking was more popular than jogging in Finland and has a dedicated following across Germany. Selecting the right pole is the most important consideration when embarking on this sport. Traditional walking and ski poles are not manufactured to meet the specific movement needs of this sport and therefore should be avoided. Nordic walking poles are designed to work in harmony with the body in a fluid and organic way, and it is often said that the poles become an extension of the body. To ensure they are the correct length adjustable poles should be used, and according to the British Nordic Walking Association these are the best ones to obtain. A final consideration is ensuring that you obtain proper training in the technique. Poor technique and the wrong sized poles can result in injuries, so it is important to enlist the help of a trained instructor. Most countries will have a Nordic Walking association through which a list of trainers can be obtained. Nordic walking is an excellent all-round calorie burning and upper body strengthening exercise. It can be incorporated into any exercise programme aimed at achieving a mesomorphic physique, and is relatively free of any serious risk of injury. Excellent site dedicated to exercise and dietary advice aimed at the development of a mesomorphe body shape. Site offering advice on arthritis, fitness and diet. If you are looking for something to do this summer in the Cleveland, Ohio area, take a trip to Squire's Castle for a picnic, walk, or hike through the nearby forest. Ice cleats for traction on ice: Find out which ice cleats for shoes and boots work the best.